John H. Bahlmann, proprietor of a general store at Goodenow, was born in Washington Township, Will County, December 12, 1866. His paternal grandfather, Henry Bahlmann, Sr., was one of the oldest settlers of the county at the time of his death, which occurred in December, 1893. His wife had died earlier in the same year. They came to America in 1854, when their son Henry, the father of our subject, was a young man of eighteen years. He was born in Germany, engaged in farming on the old homestead after the emigration to the new world, and in the course of years became the owner of three hundred and seventy-five acres of valuable land as the result of judicious investment, careful management and unfaltering energy. He married Dorothea Harste, a native of the province of Hesse-Cassel, Germany, and they became the parents of six children: Henry, who is living on the old home farm and is supervisor of Washington township; William, a barber of Chicago; Charles, whose home is in Beecher, Illinois; John H, of this review; Mary, the wife of John Herman, of Cissna Park, Illinois: and Lena, who is living with her sister Mary. The father died September 10, 1886, at the age of forty-eight years, and the mother passed away a few years ago. No event out of the ordinary occurred to vary the routine of farm life for John H. Bahlmann in his boyhood days. The early spring found him at work in the field and the late autumn saw him at work gathering the corn. 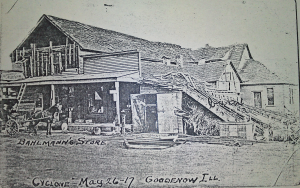 In the winter months he attended the public schools, but his attention was largely given to the farm labor until he was twenty years of age when he came to Goodenow and began clerking in a store. Two years later, in 1890, he engaged in business for himself, building a store, equipping it with a stock of goods and then opening the doors to the general public. He has since ranked among the leading merchants of the town and his trade has steadily grown. For four years he has also owned a store at Eagle Lake and is conducting a good business at both places. His close application, his study of the trade and the public demands and his unabating diligence constitute the salient elements which have led him forth from a comparatively humble financial position to the plane of affluence. citizens of the village in which he makes his home. Mr. and Mrs. John H. Bahlmann of Goodenow gave a family reunion with the people of Goodenow included, consisting of about 35 families, to welcome home their son, Harry, wife and little son of Oregon. All were asked to come to the so-called Scheiwe Grove east of Goodenow. Truckloads of things were taken to make it pleasant for all. The ladies brought baskets of everything good to eat that could be thought of. Hot coffee was made on the grounds. A big table with an elaborate dinner was set and served cafeteria style. Mr. Bahlmann furnished an abundance of cigars, pop, lemonade, ice cream, oranges, bananas, melons, apples and peanuts, plenty for all and more too. The afternoon was spent in visiting, speaking, playing cards and games and tricks of all kinds were carried out, prizes were given to the winner, and taking in all in all everybody had a wonderful time. The afternoon being an ideal one for this time of the year, made the last fact an assurance. Towards evening everybody got ready for a second lunch of hot coffee, sandwiches, pickles, cake and ice cream. All departed about sundown for their homes, voting John and Anna Bahlmann as splendid entertainers. John H. Bahlmann, popular post master and general merchant of Goodenow, and a lifelong resident of this community, died suddenly at about 9 o’clock, yesterday morning, at his home at Goodenow. Mr. Bahlmann had been ill with a heart affliction the past couple of weeks, but, it was thought, he had practically recovered from the effects. He was feeling fine, yesterday morning, and had a hearty breakfast. He even remarked how good he felt. Shortly after getting out of bed, however, he was attacked with a vomiting spell and members of the household were scarcely able to get him back to bed when his heart action stopped and he breathed his last. For a long period of years he conducted a general store at Goodenow and also conducted a like store at Eagle Lake, in the days of the old Eagle Lake Brick and Tile Co., and when the yard was in operation. This latter place closed when the brick yard ceased to exist and since has devoted all of his time to his business at Goodenow. He was about 59 years old. Funeral services will be held at 1:30 o’clock p.m. Sunday, at the house and at 2 o’clock at the Zion Lutheran Church at Beecher. 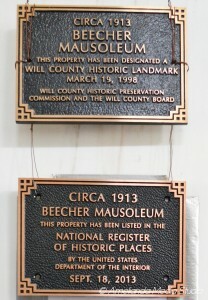 Interment will be in the Beecher Mausoleum. A complete obituary will appear in this paper next week. John Henry Bahlmann was born at Eagle Lake Dec. 12th, 1866. There he was also baptized, educated and confirmed in the Lutheran faith. At the age of 23 he was married to Miss Anna Wehrmann on May 25th, 1890. Their married life, therefore, lasted for nearly 36 years and was a very happy one. The young couple went to housekeeping in Goodenow where the deceased conducted a general merchandise store ever since. Throughout life he enjoyed health, prosperity and a large circle of friends. He provided higher education for all his grateful children. For the greater part of his life he was a member of the Eagle Lake Lutheran Church but some years ago he transferred his membership to Zion Evangelical Lutheran Church at Beecher. He always took a keen interest in church affairs and was a liberal supporter. About three months ago he began to suffer from heart trouble. During the last two weeks he was compelled to take to his bed and engage professional nursing. He grew stronger steadily and was planning to discharge both physician and nurse at an early date. All of the sudden, last Wednesday morning, his condition became alarming and he passed away before medical aid could reach him. He died at 8:30 a.m. on Wednesday, April 28, at the age of 59 years, 4 months and 16 days. His family, with the exception of one son, was at his bedside when he passed away. Those who survive to mourn his death are his sorrowing widow, two sons, Harry of Portland, Oregon, and William of Goodenow; two daughters, Mrs. Ruby Pfoff and Miss Helen of Goodenow; two daughters-in-law, one grandchild, two brothers, Henry of Beecher and William of Chicago, and two sisters, Mrs. John Herman and Miss Lena Bahlmann, both of Cissna Park, IL. Funeral services were conducted Sunday afternoon at 1:30 from his late home to Zion Evangelical Lutheran Church at Beecher, where Rev. W.H.L. Schuetz spoke words of comfort in both English and German. The church could not begin to hold the large number of friends who came to pay their last respects to a life-long friend. Interment was had at the mausoleum. This entry was posted in Automated Burial Listing, HEADSTONE, Obituaries- Have Full Copy, St. John Evangelical Lutheran Church - Eagle Lake, Zion Ev. Lutheran Church, Beecher by Sandra. Bookmark the permalink. 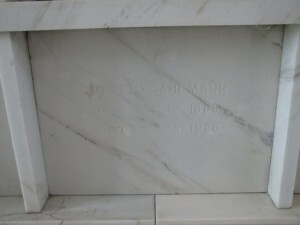 All of the Bahlmanns and Bahlmans in this mausoleum are related. Some dropped the last “n” and some didn’t. If anyone knows when and why they changed the name, please post a comment. 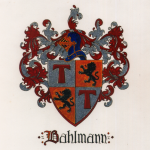 I believe Henry F. Bahlman dropped the “n” between 1910 and 1924, and I wonder if it had something to do with World War 1 and anti-German sentiment in the USA. John Bahlmann and Henry F. Bahlman were brothers. 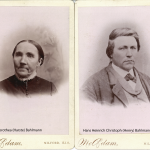 Your research into the history of the Bahlmann Family is very interesting and appreciated. I am passing this information down to the younger Bahlmans here on the west coast, and hope to visit the Beecher Mausoleum one day soon.